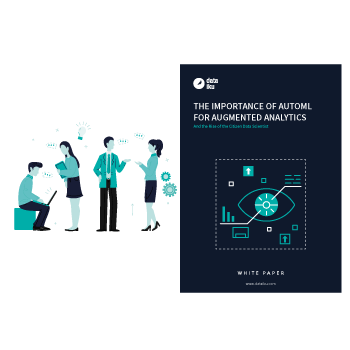 The vision for the future of augmented analytics is one of complete (or nearly complete) automation, where one could feed a dataset and a target to an automated pipeline and get back cleaned data with engineered features, together with the best performing model on top. This automation of machine learning projects - whether those projects touch company operations, processes, or product development - is the essence of the idea of Enterprise AI and would allow for greatly accelerated AI modeling. A brief definition and history of the rise of AutoML. An exploration of the difference between AutoML and augmented analytics. A look at the parallel development of the citizen data scientist. A list of essential features to look for in AutoML and augmented analytics tools. Recommendations for handling the organizational change associated with augmented analytics. Case studies of AutoML vs. humans.